Tweet, tweet: tweaks to Twitter! Twitter has come out with a new design to spiff up your Twitter Page – you now can create a new Twitter header image that will display above your tweets. The design update rolled out on September 18, but may not be enabled yet on all accounts. I just got email notification of the new design being accessible on my Twitter account yesterday morning, so making the update is on my to-do list. The header will be the first thing visitors see, whether they are checking out your profile on Twitter itself, or on iPhone/Pad and Android phones. It’s a long horizontal image running across the top of your Twitter profile (above your tweets). 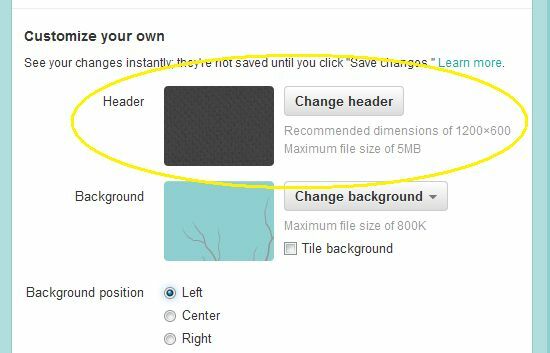 Go to the design section of your settings when logged into Twitter and scroll down to upload a header image. Maximum size is 1,255 pixels x 626 pixels. Best to go for the maximum, but certainly don’t drop below 640 pixels or it’ll end up looking bad quality. Your profile picture (avatar) will still be there, centered in the header. Over the header image will be a light colored bio text. Think of a light colored text on a light colored background…not so easy to see, right? So, you should go for a little darker picture to complement the light colored text. You may need to play around with this a little to make sure your bio is clearly visible. An image that is too busy could detract from your deets and make them hard to read. Need a little inspiration? Check out this post with visual ideas for great headers! Don’t be afraid to have fun and get creative. 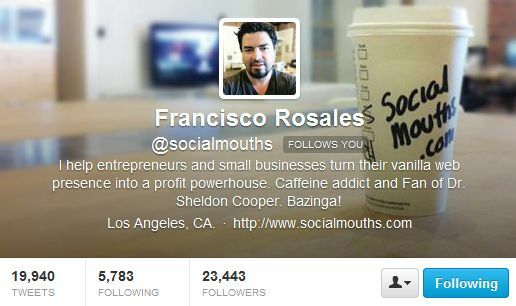 With this new design, your bio will really pop – it floats over the header image. Make it count! If you haven’t bothered to create one, or one that you really like, now’s a great time to revisit! Photo streams are now easily accessible on iPhone, Android and iPad. Twitter is definitely trying to be more visual. Have you experimented with posting images to Twitter? Why not give it a go? People like visuals! I read in this article that you also now have more options with your background image, which can now be seen on the left and right hand side. This is a little vague and I was trying to find more info on that, but was unsuccessful. If anyone has any additional insight on this, would really appreciate you sharing it below! And voila! There you have the latest tweaks to Twitter. Have you made the change to a header image? Feel free to leave a link to your small business’ Twitter profile in the comments so we can check out what you’ve done and get some ideas! Great post! The issue with the backgrounds is almost as big as getting the new banner! Before, all backgrounds were aligned to the left of the page. This made it very difficult to design a background because the content area was aligned in the center of the page. This made it hard to know where the background would line up, especially the right side of the screen. Very small screens and very large screens ended up looking very different and it was a game to play, figuring out where to place background elements so that you see them at different screen sizes. Now with the ability to center the background we can now know exactly where the edges of the Twitter interface will line up with our backgrounds! I saw it on Facebook when you posted it, then I went ahead and took care of it, great job! The new Twitter features seem to bring with them a lot of possibilities. Haven’t had the chance to delve into it much yet, but your post will be a very helpful guide when I have the chance.